Hair Bows | Easy Steps for making your own hair bows! Hair bows can be made to look like they were purchased at a boutique! On this page you will find the links to instructions for all the accessories have listed, but you will need to visit often because we are constantly updating the site and adding more craft projects for you to make. When you are ready to make korker hair bows, you will need to make your own Korker Ribbon. You will need some korker ribbon for some of the hair bows instructional tutorials! Heat up your wood working to until it is as hot as it will get. The only way to know for sure if it's hot enough is to try it out on a piece of scrap ribbon and see if it sears and seals cleanly for hair bows. 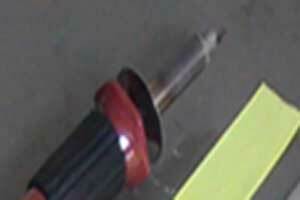 Be extremely careful with this wood working tool because it get's very hot and will burn anything it touches! Watch youtube sealing ribbon video! Place ribbon on top of the cookie sheet (I turn my cookie sheet up side down and use the bottom for my work area.) 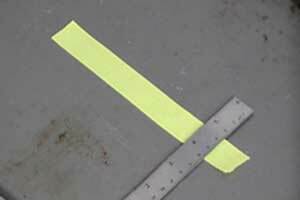 Place ruler at the point where you want to sear or seal the ribbon. Using the wood working tool, place the tip of the tool on the metal cookie sheet. It is much easier to drag the tool through the ribbon if it starts on the cookie sheet. 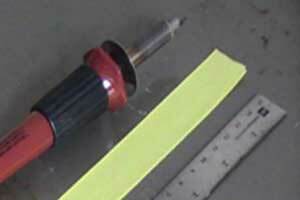 Now, slowly drag the tool along the edge of the metal ruler. You should be seeing the ribbon seperate. You can run the tool up and down the ruler to be sure it's seared and sealed. But, that's all there is to it! It sure beats trying to cut my ribbon and then sealing it with a lighter. Give it a whirl- you will love doing it this way! Copyright © 2009-2018 Craft A Project All rights reserved.